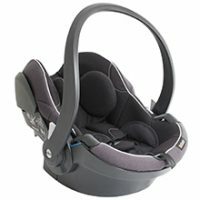 When protecting yourself during car journeys by buckling up with the 3-point vehicle belt, you can also protect your unborn child by making sure that the vehicle belt is positioned beneath your baby bump. 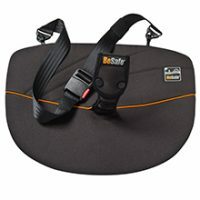 BeSafe’s pregnancy belts – Pregnant iZi FIX and BeSafe Pregnant – help you to keep the vehicle belt in the right position and thereby prevent injury to your unborn child in the event of an accident or even when braking harshly. 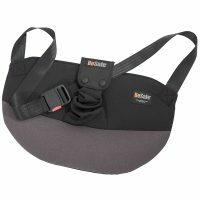 Besides increased safety, the BeSafe pregnancy belts also provide great comfort for the expecting mother, as they hold the vehicle belt in a comfortable position, so that you do not have to permanently push it down during the car journey. In the event of a collision, a grown-up person is thrown forward with a force of 3 to 5 tonnes. The baby during pregnancy is placed in the front of the tummy and is thereby exposed to an extreme load during the collision. During heavy braking or a collision, the forces impacting the tummy and the baby become so strong that they could risk harming your unborn child seriously if the 3-point vehicle belt is not positioned properly. BeSafe pregnancy belts place the vehicle belt over the hip bones – bones being our body’s strongest parts – and away from the baby bump. As a result, the forces are led away from the baby and the 3-point vehicle belt can function as it is designed to. Besides increasing the safety for the unborn child, BeSafe pregnancy belts also increase comfort for the expectant mother. By positioning the vehicle belt below the tummy and over the hip, it reduces uncomfortable pressure during the journey. Protect your baby already pre-birth, read more about Pregnant iZi FIX and BeSafe Pregnant here! Read more about the first step of BeSafe’s iZi Modular concept – the BeSafe iZi Go Modular i-Size – here!